beside posting photos that is…. Well, I am on vacation this week, sort of. Had a meeting today, and have done a lot of emailing, but basically I am on vacation. It is one of my favorite kinds of vacations – doing puttering around the place. Not working hard, yet things get done. Yesterday I washed the bedroom and bathroom windows. It is so nice to get the summer’s grime off of them so I can see the woods again. Today I think all I did was laundry… and catch up on the blogs I read. My favorite? Eldest niece C’s, of course. She keeps me up to date on what’s in vogue on all fronts. And I learn things about her that I never knew. It’s fun. That girl can write. It is chilly here tonight – we left all the windows open last night, and the house never got warm today, although it was beautiful out. So I closed it all up tonight and have a fire going. It is nice. I have been knitting a little something for brother N’s birthday – the giant pile of November birthdays is bearing down on me! Anyway, like the Christmas cards, I can’t share it with you yet, but I will as soon as he opens the package… anyway, is there anything cozier than sitting in front of a fire knitting, with a cat curled up beside me? I doubt it. I just wish A was home to enjoy it, but she is on the road tonight. These aren’t great, but they ARE photos. The hats are the ones I have done for Nest (http://nestmaine.blogspot.com/), and as soon as I have a box full, they will go off to keep some folks warm. 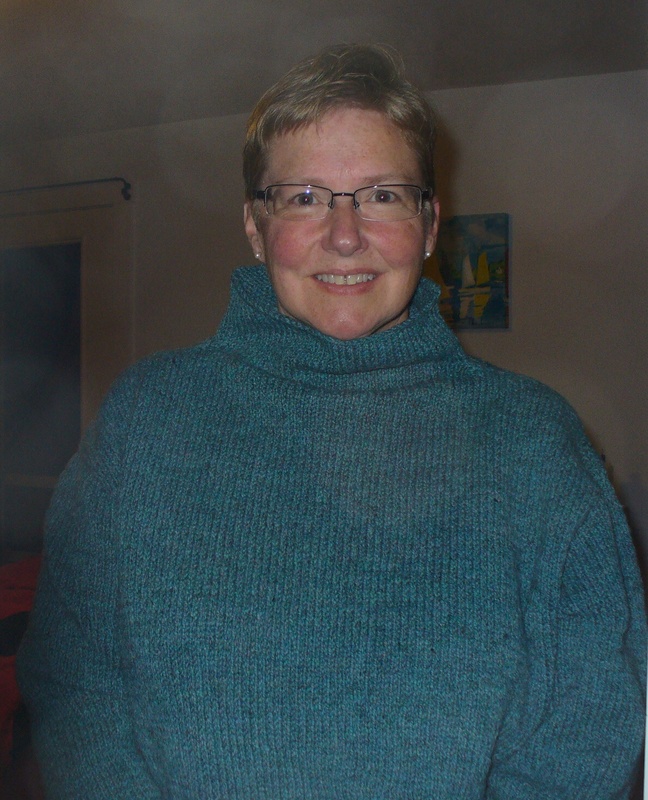 The other is the sweater I knit with the St Andrews NB yarn. Hard to see it, but it is a basic, unstructured sweater in a deep bluey-green. With a DEEP turtleneck. It should keep me warm this winter. I drained the pool. I put it off as long as I could, but yesterday was sunny and warm, and it was probably the last day like that. And draining the pool means getting soaked, it is no fun to do in the cold. So I did it. It means that summer is truly over. Yes, I can go to the lake and go for a swim if we have a hot day. Yes, I have gone swimming in October. Although, maybe not in Maine. 🙂 But not having the big blue bubble in the backyard means that summer is over. No matter what else happens. So for me, it is the saddest day. Summer is my favorite season, no matter how hot and muggy. No matter how cold and rainy. I love it. I like fall, I really do. Crisp days? Bright blue skies? Fabulous. But it isn’t summer, and when it is fall, summer is as far away as it can be. I hate having it dark when I go for my walk in the morning. I hate having it dark when I go to work in the morning and when I get home at night. In the summer, it is light when I get up in the morning and light when I go to bed at night. I love that. That is 9 months away. First off – it’s Friday – the best day of the week. I have lots of chores to do as usual, but I really don’t seem to mind them on a day when the breezes are blowing, the sun is shining, it is NOT HOT. Perfect early autumn day. My geraniums are blooming like mad, not sure what they were waiting for, but the deck looks gorgeous. I hope I get to sit out there and enjoy it at some point today. Last night was book group – we read Snow Flower and the Secret Fan by Lisa See. Such a good book, but so disturbing, in so many ways. How do cultures evolve to have such oppression? Why does it take so long to change it? Next time it is Mayflower, by Nathaniel Philbrick. I started it earlier this summer and am slowly enjoying it. It is dense with information, so takes me time to absorb and process. One mystery has been solved, although the book doesn’t go into the issue at all – Priscilla Alden chose wisely when she chose John over Miles Standish. 🙂 Miles seems like a difficult man. Anyway, the conversation, as always strayed far from the book, but we had a good time. Tomorrow we are meeting and going to Brooksville to visit the Nearings home, and Eliot Coleman’s farm – we’ve been wanting to take that road trip for a few months, since reading Melissa Coleman’s book, and finally the day is here. The day promises to be as beautiful as today, so it should be fun. Knitting is coming along – have finished the body of the sweater, and am working on the ribbing, which I hate. Not sure why but that whole knit purl thing drives me crazy. I did ge the buttons for it this week – nothing to fancy, the ones I really liked would have been over $30 dollars. Seemed foolish, so I went with some pretty but less expensive (MUCH!) ones. Honestly, this sweater should be done soon, and I SWEAR I will post photos of it. And I will feel sorry for you that you can’t touch it, since it is just so soft. A friend who recently lost her mother gave me a whole bag of old sewing patterns – from the 40’s on, I would guess – that she found when cleaning out her Mom’s house. I had asked her for them so I could scan the envelopes for crafting, but she doesn’t want them back. So maybe I will make some cool retro outfits someday. What is truly too funny is the fact that there is a pattern for really elaborate Barbie doll (or rather, 12 inch fashion doll)clothes. I can’t imagine how fussy they would be to make! And I doubt I will be finding out anytime soon! But I will scan the envelopes and use them for cards – and the first one will be for her. MAYBE I will post a photo of it. Haven’t been in the pool lately – the one really hot day this week, I was in Bangor and didn’t get home until after dark. But I am holding off on emptying it, hoping for a few more good swimming days. I don’t think today will be one, because of the cool feel to the breeze. In fact, the market umbrella just blew over! It MIGHT be time to bring that in, I guess. I love the fall, but sure do hate what it precedes. Or rather, how long it will be until it is warm again. So. I should get on with my chores, one of which is cleaning out the pellet stovepipe. Winter waits for no one. Author salpal1Posted on September 16, 2011 Categories how I spent my day, what I am making, what I am thinking about makingTags alpaca yarn, autumn, Barbie doll, Brooksville, fall, knit, mayflower, sewing, too cold to swim, vintage sewing patternsLeave a comment on What a perfect day!!!! long short week, but hopefully not a short long weekend! I only had to work two days this week, thanks to a holiday and a day off, but those days were LONG. Lots of changes at work, and that can be stressful, and stress makes for long days. But they are through now, and I am 1/4 through a 4-day weekend – very nice! Today we started cutting the wood for that bed A has been wanting to make for almost a year now!!! Of course, that involved a trip to the big orange box for a special saw blade. But at least it didn’t require a special saw… so that was good. We got the drawer pulls for the drawers that will be under the bed. I knew just what I wanted, and lo and behold, they had them! Since they will be right at shin level, I wanted something curved, not square and sharp. Martha Stewart had some that were close, but they had screws that showed after installation, and I just didn’t think they looked as nice as the ones with the screws hidden. Not often that I don’t like the looks of an MS product. Anyway, we got the ones I did like, and as always at big orange (or the Home Despot, as I like to call it) we managed to find a few other things as well. While we were in Ellsworth, we stopped at the farmers market – it was a dreary day, and so some vendors didn’t show, but at least my favorite farmer was there, and so I have some Happy Town vegetables to eat now. No molasses cookies, though, but I guess we don’t need those in the house. And Paul said my bushel of tomatoes for canning will be in soon, which is super good for me – I love canning them, and I love having summer tasting tomatoes all year long. It’s like opening a jar of summer in the dark of winter. Ran a lot of errands this morning, so hopefully tomorrow will be a quieter day – I know we will make a trip to Belfast to get a baby present, but other than that, I think we can hang out at home being creative. I think I have the patience for the next step in the roman shades, and I know A is looking forward to using her Kreg system to make the boxes for the bed. Someday soon there will be very exciting photos of finished products to show you all! And my sweater is coming along – I do love this pattern, it goes so fast. Another couple of inches on the sleeves, and then I knit from the arm holes down until it is finished. The yarn, from Good Karma Farm in Belfast, is really soft and delicious – I love how it feels sitting on my lap as the sweater grows. It is a wool alpaca blend, could not be softer! Author salpal1Posted on September 8, 2011 September 16, 2011 Categories how I spent my day, what I am makingTags alpaca yarn, farmers' market, Good Karma farm, Happy Town Farm, home depot, long week at work, martha stewart, sewing, woodworkLeave a comment on long short week, but hopefully not a short long weekend! Wow, I can’t believe summer is almost gone. It seems like it just started. Sigh. But the good news is that the weatherman is totally wrong about our weather – we had a pretty nice weekend for one that was supposed to be a washout! A and I both had to work a half day on Friday, but otherwise enjoyed a leisurely relaxed weekend. We went for a bike ride, went to the Blue Hill Fair – saw some great sheepdogs work at the trials, ate a little fair food, rode on the Scrambler – fun ride! and looked at lots of craft exhibits. It wasn’t crowded at all (was supposed to be pouring rain, after all!) so I enjoyed it more than I could ever have imagined. Yesterday I spent some time in the craft room – how else could it be a perfect day??? and in the pool and reading in the sun. Another gorgeous rainy day! In the craft room, I worked on the roman shades I am making for that room. I figure if I work on them a little at a time, they will never make me cranky. 🙂 I also worked on a little card I am making for Ma – it is slow going because I keep messing it up and have to start it over again. But I will get it right eventually. I am reading three books right now – Mayflower, Deliver Us From Evil, and Snow Flower and the Secret Fan. Mayflower is very interesting – I am learning lots about that era – and am grateful I live in this one! That and Snow Flower are book group reads, and Snow Flower needs to be done by next week. I have read quite a bit of the latter – set in China sometime not too recent, I hope. The little girl just started her foot binding. What a cruel practice. Yikes. Deliver us From Evil is just a good whodunit – David Baldacci writes some good books! I have mastered reading in the pool while lying on a float – but it seems to me it is getting to be a chillier endeavor as each week goes by. I expect it won’t be too long before I have to put the pool to bed for the winter. Ugh, I am not ready for that season yet. A is on vacation this week, she is so ready for a rest. She hopes to do some work in the cellar on that bed of ours that she wants to make – I hope that she does – it will be great to have it done! Other big news – since the cat went blind, mice have moved into the basement – we hear them scurrying around under the floor at night. I have set a little have-a-heart trap and caught and relocated eight of the little dears so far. Haven’t caught one in the last few days, but we still hear some activity, so I have to think about new bait or a new location for the trap. I have been using peanut butter. Anyone have any other ideas? After I catch them, I haul them off to lovely new locations. I have taken three to the woods behind the office, one to the parking area at Blue Hill Mountain, and four over to the field behind the Post Office. I hope they find lovely new homes and stay out of ours! Author salpal1Posted on September 6, 2011 September 6, 2011 Categories how I spent my day, what I am makingTags bike, Blue Hill Fair, David Baldacci, Deliver us From Evil, mayflower, mice, sewing, sheep dog trials, snow flower and the secret fan, summer day, swimLeave a comment on September? Already?